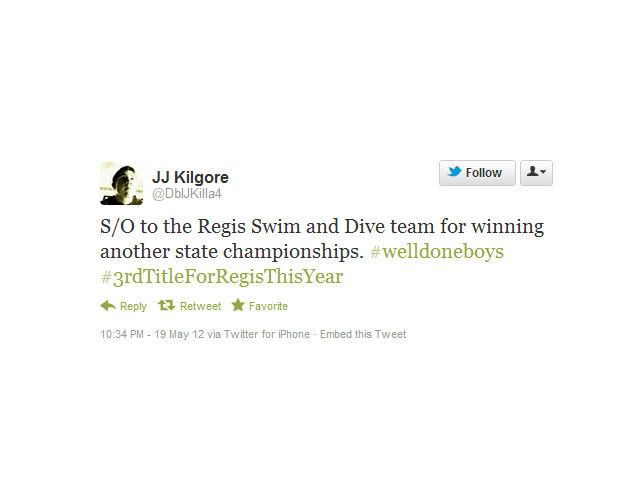 Clark Smith led the Regis Jesuit men to a state title in Colorado's 5A. The Regis Jesuit girls’ swim team, and specifically their rivalry with Cherry Creek, is among the best-known high school programs in the country. That has a lot to do with a certain superstar named Missy Franklin who leads that team. But it is in fact the Regis boys that is the more dominant of the two programs. This weekend they sent their seniors off in a big way as they won their 17th Colorado 5A State Championship in the last 18 years the day before the class of 2012 walked across the stage for their graduation. The Regis boys are also led by a junior, and though not a National Teamer, he too should be a top-10 recruit in the class of 2013. Clark Smith won his third-straight 100 fly State Championship with a 48.73, setting him up to attempt a four-peat at next year’s meet. That would repeat the feat that Heritage High School’s Mark Dylla pulled off from 2004 through 2007 in the same event. 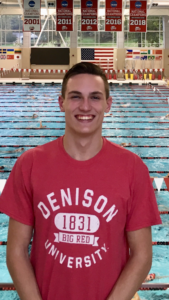 Smith DQ’ed the 50 free final at last year’s meet but was the top seed after prelims; this season the state’s best sprinter swam three relays instead to help his team’s overall effort, and that resulted in wins in both the 200 free relay (1:25.53) and 400 free relay (3:04.91). Both of those swims were narrow wins ahead of their rivals from Cherry Creek, who took the meet-opening 200 medley in 1:32.07. For the second-straight year, that’s a new State Record for the boys from Cherry Creek, who improved that time thanks to returning three swimmers from their winning group in 2011. Cherry Creek was led by their star Daryl Turner, another junior who pumped some serious air into his recruiting stock in this meet. He took two wins, the first coming in dominating fashion in the 100 free in 44.33. That’s back-to-back titles for him in this race, except that this swim was 1.7 seconds faster than his swim from last year. That took down a 15-year old State Record in the race held by Jay Schryver with a 44.63 from 1997. Turner’s second win came in the 100 backstroke, where he again broke the State Record – this one held by the aforementioned Dylla from his senior year in 2007. The 48.18 is almost a full-second improvement for him. Regis really broke this meet open midway when their divers Kyle Goodwin and Matt Mauser went 1-2 on the 1-meter. They actually had three boarders in the top 8, whereas Cherry Creek didn’t have any. Ponderosa High School wasn’t in contention for the team title, but Ponderosa’s Carter Griffin swept the longer freestyles; first with a 1:40.92 in the 200 and following that up with a 4:34.43 in the 500. This is a huge shift in focus from last year’s meet, where he failed to even make the B-Final in either the 100 fly or the 100 back. Since swimming these two races toward the end of his 2011 high school season at a club meet, he’s dropped 5 seconds in the 200 free and 12 seconds in the 500. Now he’ll have his entire senior season to focus on improving those times even further with a new focus; he’s a great candidate to perhaps sign in the spring of his senior season. Regis Jesuit’s Ben Fry in the 50 free in 21.17, just ahead of Heritage’s Joey Hinton. Pomona’s Noele Tesone in the 200 IM in 1:49.84. Loveland’s Nick Hatanaka in the 100 breast in 56.62; the junior was 3.5 seconds faster than he was in placing 6th at last year’s meet, and broke the 5A Record with this swim. In the 4A Championships, the Air Academy High School Kadets won a much tighter meet, with just an 8.5 point margin for their first state title since 1999. The boys from D’Evelyn, led by Stanford-bound senior Jeff Garnier, came in 2nd. The Air Force boys got off to a good start by winning the 200 medley relay in 1:36.19, but they would muster only one more victory in the entire meet – a 49.79 from Devon Davis in the 100 fly. They took this meet on their depth, as they had at least one swimmer in the final of each individual event except for diving and the 100 free. A lack of freestylers, though nearly cost them the championship; especially because that’s where D’Evelyn and the aforementioned Garnier are so strong. Garnier first crushed the state record in the 200 free with a 1:37.18, which knocks more than a second off of his best time. He also won the 100 free in 45.44. His 100 free flat-start wasn’t a great time (though it was his best), but he anchored a pair of relays in 20.0 and 44.4 freestyle splits, showing his potential for the Cardinal. Longmont High School’s Connor Dwyer (This one has two n’s, as compared to a single n from the Florida Gator) capped off his highschool career by taking two individual titles. The first was in the 200 IM in 1:52.92, and the second making back-to-back wins in the 100 breast in 56.00. Those were both big best-times for him, and really has to make the coaches happy at Western Kentucky, where he’s committed to swim in the fall. He will have one year to develop there, before the Hilltoppers’ two best breaststrokers graduate after next season. Jonathan Littles from Cheyenne Mountain took the 50 free in 21.52. Nickell added a second win in the 100 back in 50.54. He’ll be headed to the Naval Academy next year. Top 8 results available here through a local Colorado NBC affiliate. Thinking the Cardinal will make Jeff Garnier a 200-500 guy? 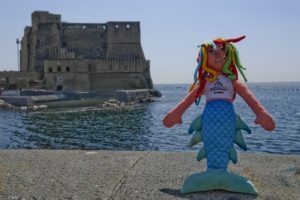 He popped of a 20.04 and 44.42 on the back end of D’Evelyn’s freestyle relays. Thinking probably not although who knows a lot can happen in a year. Yikes! 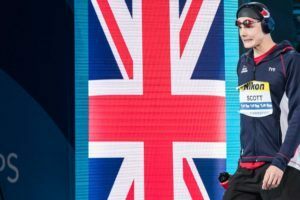 Didn’t have relay splits – I take it back.